Dolphins, smaller whales and seals are among the 87 species of marine mammals eaten in a staggering 114 countries throughout the world, a new study has revealed. Rare species including the South Asian river dolphin and narwhal, Chilean dolphin, the long-finned pilot whale and pygmy beaked whale, plus Burmeister's porpoise are among marine mammals eaten in at least 114 countries since 1990, according to the Wildlife Conservation Society (WCS) and Okapi Wildlife Associates (OWA). Manatees, dugongs, seals, sea lions and even a polar bear (which is regarded as a marine mammal) are also among the 87 species of marine mammal consumed since. Lead author, Dr. Martin D. Robards, of the Wildlife Conservation Society, says, "International regulatory bodies exist to gauge the status of whale populations and regulate the hunting of these giants. "These species, however, represent only a fraction of the world's diversity of marine mammals, many of which are being accidentally netted, trapped, and - in some instances - directly hunted without any means of tracking as to whether these off-takes are sustainable." The study which examined 900 sources was co-authored by Dr. Randall R. Reeves, of the OWA, and others, and is published in Biological Conservation. The authors initially looked at records of small whales, such as pilot whales, dolphins and porpoises from 1966 onwards. They then took three years to check around 900 other sources and only investigated those with real evidence of human consumption. Since 1970, smaller aquatic mammals, especially those in coastal and estuary waters, were often consumed after being accidentally caught as "bycatch" on fishing trips. This was particularly the case in poorer areas of the world. Dr. Howard Rosenbaum, Director of WCS's Ocean Giants Programme, says, "Obviously, there is a need for improved monitoring of species such as Atlantic and Indo-Pacific humpback dolphins and other species. "In more remote areas and a number of countries, a greater immediate need is to understand the motivations behind the consumption of marine mammals and use these insights to develop solutions to protect these iconic species that lead to more effective management and conservation." WCS is working around the world to assess and prevent the threat to dolphins and other marine mammals. In Madagascar, Congo, and Gabon, WCS Conservation Scientists Dr. Salvatore Cerchio and Tim Collins are calculating the effect on dolphin populations and working with local fishermen to prevent accidental bycatch. 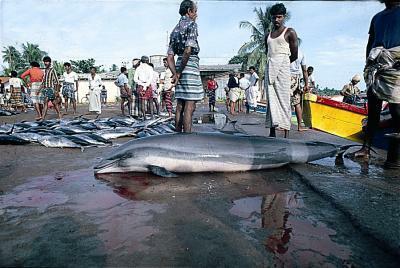 They have identified a disturbing trend of rising captures and the dolphins being sold for food in markets. In Madagascar, WCS has worked with local communities to set up a local conservation association. It increases awareness of local laws protecting dolphins, and develops community-based whale and dolphin watching as an alternative way of earning money. 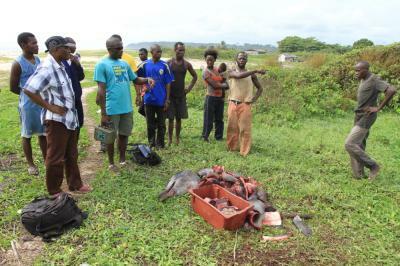 In Gabon and Congo, WCS is trying to conserve the rare Atlantic humpback dolphin that risk being captured in coastal gillnets set by local fisherman. Tim Collins says, "The Atlantic humpback dolphin may well be the rarest mammal in the Congo basin region. Unfortunately, few have ever heard of it, least of all the fishermen eating them out of existence."